Manchester United midfielder Paul Pogba has laughed off any haters doubting his unusual penalty-taking technique after he had a spot-kick saved against Everton at the weekend. 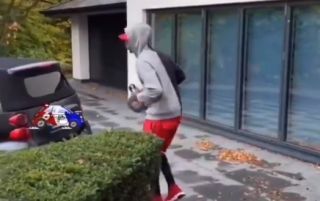 Watch the video below as Pogba makes reference to his slow, small step technique by running up to his car in the same way. This clip has gone down pretty well on social media, though many were critical of Pogba for his use of this strange run-up against Everton. The France international did at least put away the rebound after Jordan Pickford saved his initial effort, and he has also used it before with success. Joe.co.uk quoted Gary Neville as saying the run-up was just for show, while various others have mocked the player for it, with a video going viral showing that his run-up took longer than Usain Bolt doing the 100m. You took longer than Bolt…?? ?